Individual Sessions. Regardless of whether your session is done in person, on the phone, or by proxy, each session begins when you grant me permission to access your body-mind system. At the time of the session, you can request a specific healing method, or through muscle checking, you can allow your innate wisdom to direct me to the optimal method that is unique to your current needs. Proxy Group Sessions. These Resonance Repatterning sessions are delivered as a series, over a prolonged period of time. Each session begins when every member of a designated group completes and submits his/her questionnaire granting me permission, by proxy, to access their energy fields. I then act on the group’s behalf to shift their collective resonance around a specific topic. Since, in consciousness, we are all connected, the more people participating in the group, plus the more ongoing sessions you receive, the more you achieve your greatest potential. Monthly Specials – Save 10%. Each year I select a special repatterning series designed to empower my clients to move past their limiting beliefs and create positive change in a specific area of life. Repatterning is based on the idea that everything has a vibration (resonance). It follows the Law of Attraction premise that the thoughts and beliefs we resonate with, are what we experience in life. 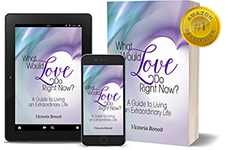 Each repatterning session in the series builds on the previous month’s healing creating greater resonance toward more happiness, abundance, fulfillment, love, and health. Each monthly session replaces patterns of negative thinking with positive thoughts and behaviors. I highly recommend taking advantage of these individual sessions every month in order to manifest a life you love, all at a discounted rate. 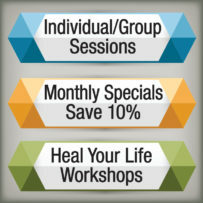 Heal Your Life Workshops – Each 3-day repatterning workshop is profoundly transformational in nature. They are intentionally designed to heal distressing life experiences so that new possibilities can emerge. The transformation relies on the premise that the participant’s innate wisdom will unlock the essence of who they really are; unfetter their creativity and self-expression; and bring about lasting changes in their perception and behavior — physically, emotionally, mentally, and spiritually. After completing the workshop, participants find they respond positively rather than react incongruously to challenging situations in their relationships, health, careers, finances, and communities. They leave feeling more centered, calm, confident, and contented.